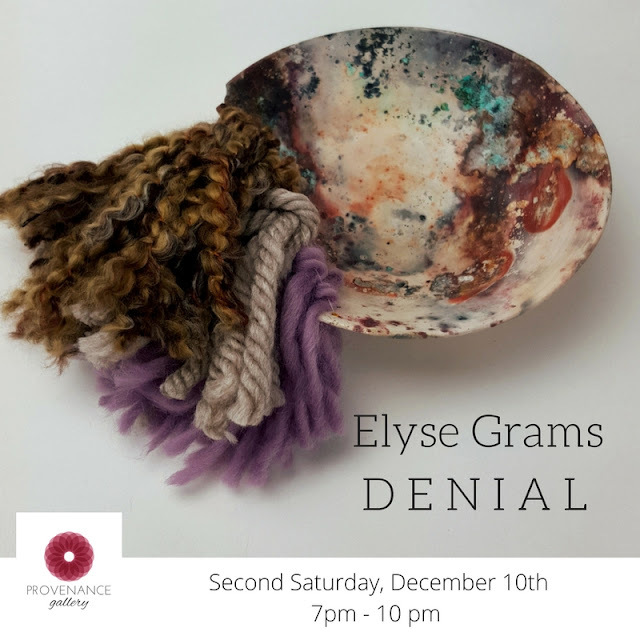 Provenance Gallery is pleased to present, Denial, an exhibition featuring mixed media ceramics by Elyse Grams. Join us for the Opening Reception on Second Saturday, December 10th. Exhibition will be on view until December 27th by appointment. “I created these pieces in response to a personal loss nearly a year ago to the date of this opening. They represent the continual re-imagining of my life, and the way we try to fill holes within ourselves and others in order to pull ourselves back together. We compartmentalize, organize, and re-file memories until they fit within boxes, that can be safely stored away, rarely to be recovered. We cover those boxes in beautiful things to hide any lingering loss or depth of feeling. Elyse Grams is a San Antonio based artist whose work explores qualities of femininity in conjunction with the ideas of functionality and uselessness. She approaches these ideas through a variety of mediums; clay, fiber, metal, and wood, using the form of a vessel as a springboard for these ideas. This work was the initial exploration of functionality and its many meanings and metaphors. She will receive her Bachelors of Fine Arts with a concentration in Ceramics from the University of Texas at San Antonio in May of 2017. There, Elyse serves as Public Relations for Clay Fusion UTSA’s ceramic club on campus. In 2016 she was awarded first place in the Annual Juried Student exhibition. Elyse expects to continue her education in a Post-Baccalaureate program or a Masters of Fine Arts program within the next few years.